Many of us strive for a sense of perfection we can never quite grasp. That pressure that we put on ourselves can lead to self-esteem issues and more. Jack Kornfield, author of NO TIME LIKE THE PRESENT, shares how we can learn to embrace imperfection through mindfulness. For Emily, who had a history of depression and anxiety, finding the freedom of imperfection required befriending shame and confusion, which she saw as a figure named Mara. In stories of the Buddha in India, Mara is the embodiment of greed, hate, and ignorance who fought with the Buddha on the night of his awakening and for years after. Each time Mara attacked him, the Buddha remained unmoved and simply said, “I see you, Mara,” and Mara would throw up his hands at being recognized and skulk away. In some later accounts, the Buddha even invited his old friend Mara over for tea. Mara appeared to Emily in the form of shame and confusion. Whenever money was tight, work difficult, whenever she gained a couple of pounds or her ex-boyfriend called, Mara would attack her. It was a familiar pattern. From childhood, Emily held a sense that something was wrong with her. “I’m not charming, good looking, smart, creative, or fast enough.” Her list went on and on. We long for perfection. The perfect partner, house, job, boss, and spiritual teacher. And when we find them, we want them to stay that way forever, never to lose the glow, never to grow old, never to have the roof sag, the paint peeling. We’re also taught to seek perfection in ourselves. Novelist Florida Scott-Maxwell writes, “No matter how old a mother is, she looks at her middle-age children for signs of improvement.” You are told that if you do enough therapy, work out at the gym, eat an especially healthy diet, watch documentaries on TV, manage your cholesterol, and meditate enough, you will become more perfect. Forget the tyranny of perfection. The point is not to perfect yourself. It is to perfect your love. Let your imperfections be an invitation to care. Remember that imperfections are deliberately woven into Navajo rugs and treasured in the best Japanese pottery. They are part of the art. What a relief to honor your life as it is, in all its beauty and imperfection. 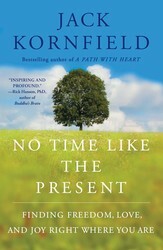 For more insight on how you can find happiness with meditation and the keys to inner freedom, pick up a copy of NO TIME LIKE THE PRESENT by Jack Kornfield. Related: Has fantasizing about our perfect match hurt us? Learn why we love best when we let go of expectations.